Payroll card provider SOLE Financial partners with Cachet Financial Solutions to release a new app with more robust, inclusive features and support for users of the SOLE Paycard. Offering this new and more robust app will give the 87% of our cardholder base who use a smartphone access to services traditionally only offered to the banked population. 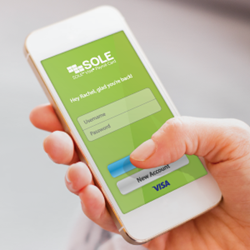 SOLE Financial Launches New Payroll Card Mobile App Powered by Cachet Financial Solutions. SOLE® Financial, a leader in the payroll card market, has partnered with Cachet Financial Solutions (OTCQB: CAFN), a leading mobile money technologies company, to release the SOLE Paycard mobile app. Cardholders will have access to their account balance, transaction history, routing and account numbers and the ability to transfer funds from the app. The prominence of the routing & account number feature on the app home screen is part of a cardholder retention initiative which aims to boost awareness of the paycard’s “take it with you” feature. The SOLE Visa® Payroll Card is only distributed through employers, but once enrolled, employees can “take it with” them and use the card for all direct deposits, even if they leave the job where they received the paycard. SOLE Financial aims to serve the underserved by providing a low-cost alternative to predatory check-cashing services for un- and underbanked employees. By partnering with employers to achieve 100% direct deposit, paperless payroll, SOLE saves employers time, paper and money while providing the convenience and dignity of traditional banking services to the unbanked workforce. SOLE paycard holders can access their hard-earned paycheck at no cost through point-of-sale and cashback transactions. Cachet's award-winning Select Mobile Money prepaid mobile platform is a cloud-based SaaS solution that enables financial institutions to offer their prepaid cardholders a full suite of convenient financial services in one easy-to-use mobile application. Available for iOS and Android systems, the Select Mobile Money platform can be integrated with existing card programs or used to develop a new prepaid card program, complete with feature-rich mobile app and branded general purpose reloadable (GPR) or payroll prepaid card. The platform's powerful back-end analytics enable financial institutions to segment customers based on behavior and send relevant marketing notifications that keep customers engaged in using the app. The Platform is also now offered with the option for Apple Pay™ integration and Apple Watch™ functionality. To learn more about Select Mobile Money, contact Cachet at info(at)cachetfinancial(dot)com. Cachet Financial Solutions is a leading cloud-based, SaaS technology provider serving the financial services industry with mobile money and remote deposit capture solutions for PC, Mac and mobile. Founded in early 2010, Cachet has quickly grown into a technology leader and trusted partner of some of the world’s largest and most respected financial organizations. With remarkable growth, an impressive client base and award-winning technologies, Cachet continues to drive innovation and deliver world-class solutions to financial institutions of all sizes. For more information, visit http://www.cachetfinancial.com. SOLE Paycard is free on the Apple App Store or Google Marketplace. Available for all SOLE Visa Payroll cardholders with an iPhone or Android smartphone. The SOLE® Visa® Payroll Card is issued by Axiom Bank, member FDIC, pursuant to a license from Visa U.S.A. Inc. and may be used everywhere Visa debit cards are accepted. The SOLE® Visa® Payroll Card is issued by The Bancorp Bank, member FDIC, pursuant to a license from Visa U.S.A. Inc. and may be used everywhere Visa debit cards are accepted.